US President Donald Trump (left) and South African Minister of Public Enterprises Pravin Gordhan. We are not a nation that ‘governs by tweets’, the minister says. Minister of Public Enterprises Pravin Gordhan responded to an American journalist’s question at a press briefing on Eskom’s dire situation on Tuesday by having a dig at US President Donald Trump and the US as a whole, by saying that in South Africa we don’t “govern through tweets”. Gordhan was asked a question about governance in South Africa. “We have far less crises than your country at the moment, and we don’t govern through tweets,” he continued in what was likely a reference to Trump’s very active Twitter presence, before saying he would “get to the crux of” the journalist’s “question regarding governance”. He did add that in his view, the US justice department worked better than South Africa’s, as they haven’t had to “suffer state capture”. 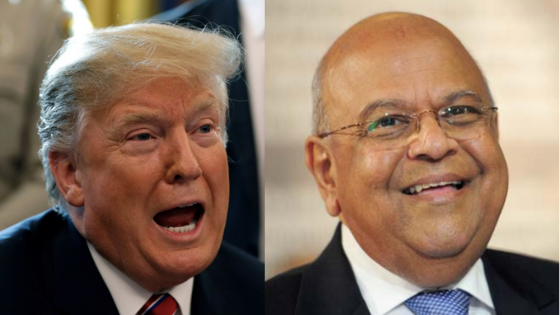 While some enjoyed Gordhan’s dig at Trump, others on social media expressed the view that Gordhan was in no position to insult another country considering the seriousness of our own problems. One user called it a “cheap shot”, another called it “petty”, and another suggested that bringing up Trump was the “best defence” the minister had at the moment. Pravin Gordhan is spot on. Listening to Gordhan taking a cheap shot at the American reporter/Trump "Unlike America, this country is not run on twitter", I thought, maybe we should also run our country on twitter, that is if we can get electricity. WARNING: The following tweet contains strong language. The press conference saw Gordhan apologising to the nation for the current energy situation which has seen South Africa’s struggling energy utility implement the most intensive batch of rolling blackouts in a decade. According to the minister, insufficient maintenance is the main cause of Eskom’s current woes. Gordhan also commiserated with the public, saying he “understands the frustration”. “We don’t have a magic formula,” he added, noting that while Eskom had 48,000 MW of installed capacity, only 28,000 MW were currently available. Eskom chairperson Jabu Mabuza also spoke, echoing Gordhan’s view on maintenance and conceding that the state company had not spent enough on this over the past five years, while new plants Medupi and Kusile had not come on stream. He admitted that in his view, the construction of these two plants was “misguided”.